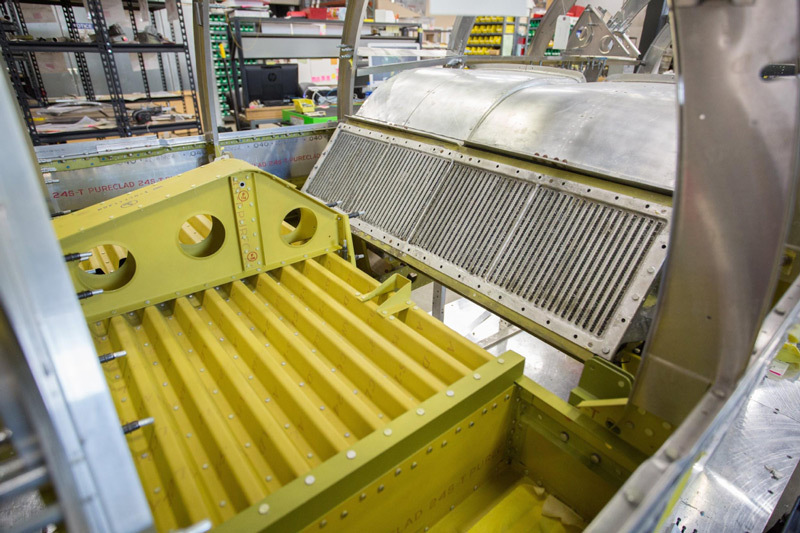 Two sections of the complicated duct-work in the P-47 await installation. 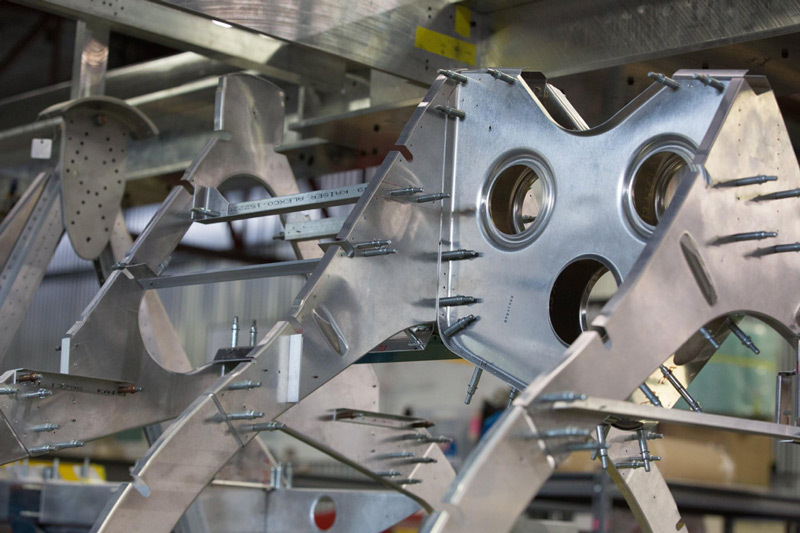 These ducts will mount on the top forward face of the intercooler and route cooled, compressed air forward to the carburetor. 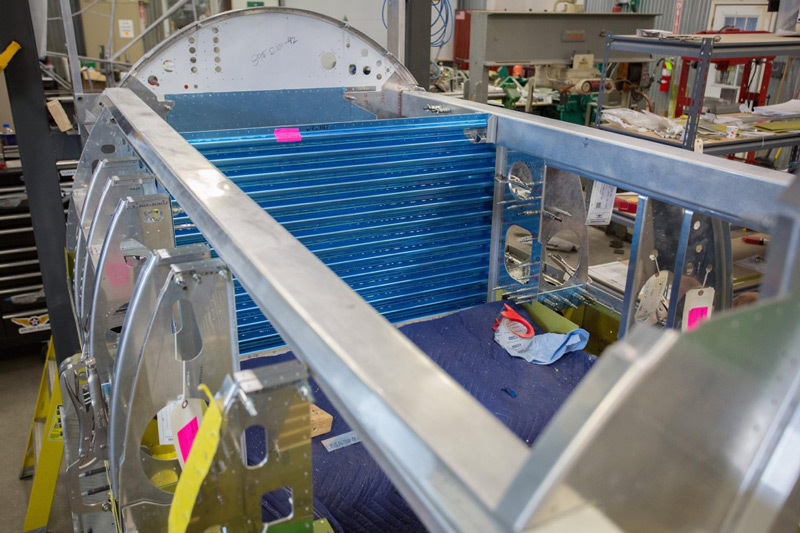 During late July and early September restoration emphasis in the AirCorps shop was centered on the intercooler system and its complicated ducting, along with continuing the assembly of the upper fuselage structure. During the month, we were contacted about a possible lead on the squadron assignment. While it remains tentative, if more information can be confirmed I will write about it in subsequent updates. 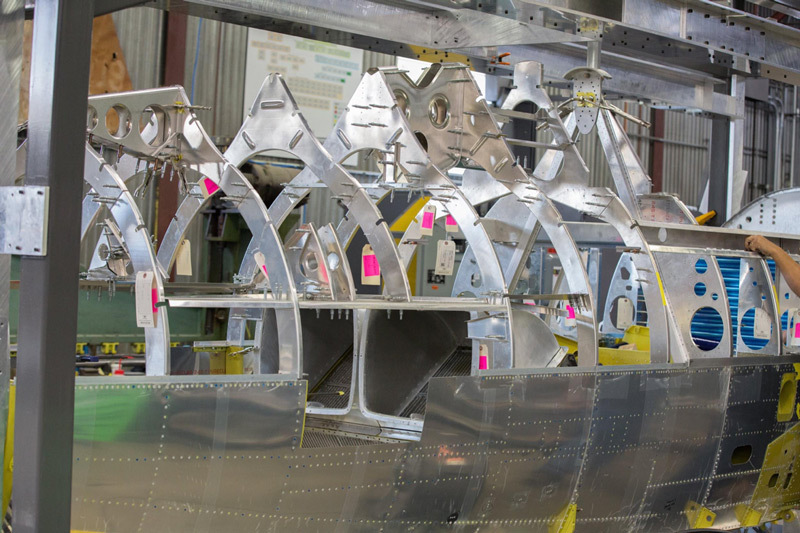 Each added component, frame, and skin section drives home the fact that the P-47 was the largest single engined fighter of WWII. 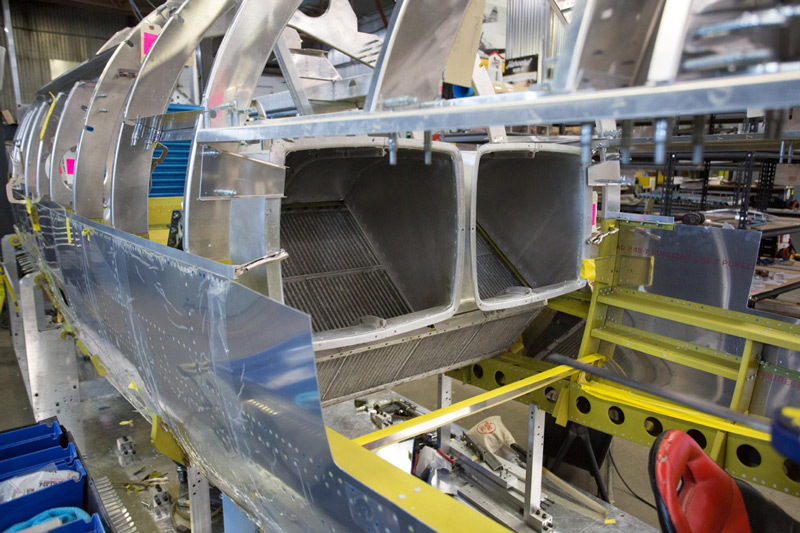 The size and shape of its massive fuselage was heavily influenced by components of the General Electric super/turbocharging system, the Harrison intercooler, and all the ducting that was necessary to make them both function efficiently. 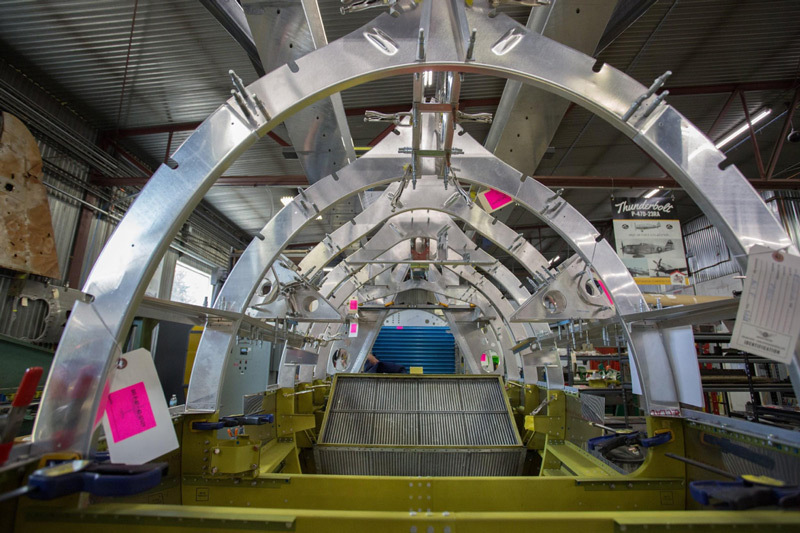 The rollover structure and the structural frame for the fuselage forward of the cockpit were just some of the projects undertaken this month as the upper fuselage goes together. 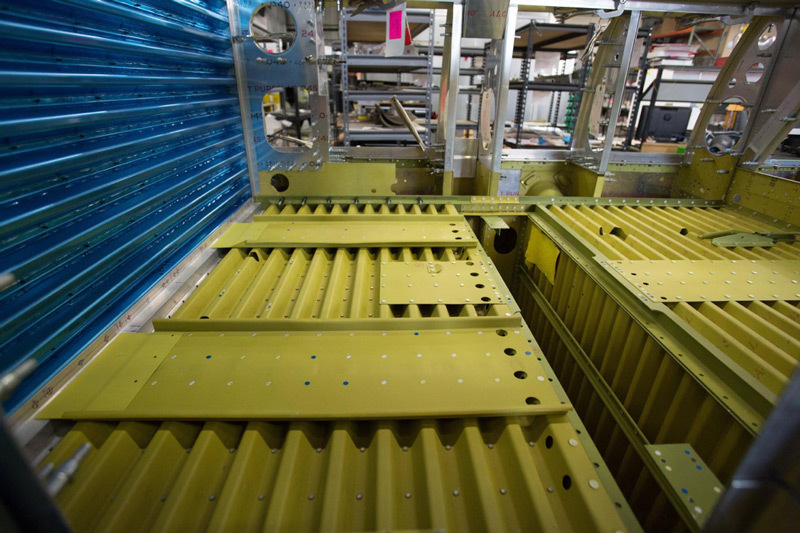 P-47: Fuselage StructureThis is the bottom face of the forward fuselage tank bay panel. 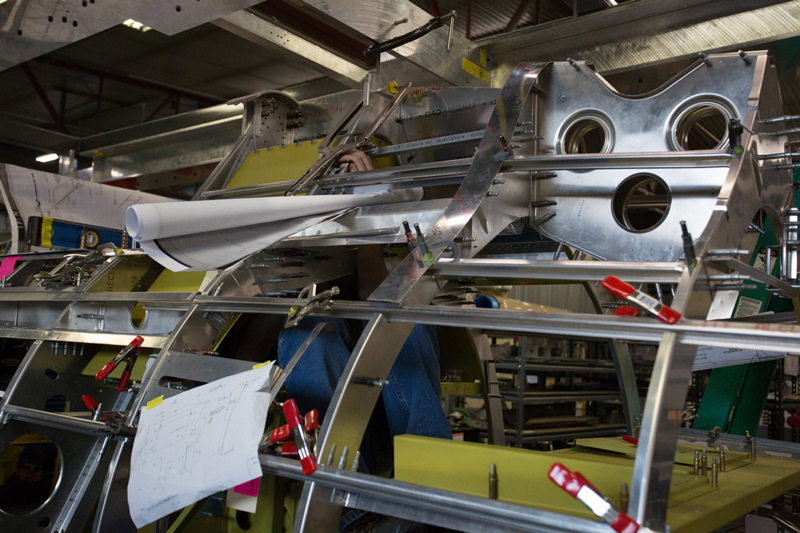 P-47: Fuselage StructureAaron peers through the structure just behind the A-frame that makes up the forward bulkhead of the razorback section and provides rollover protection for the pilot. 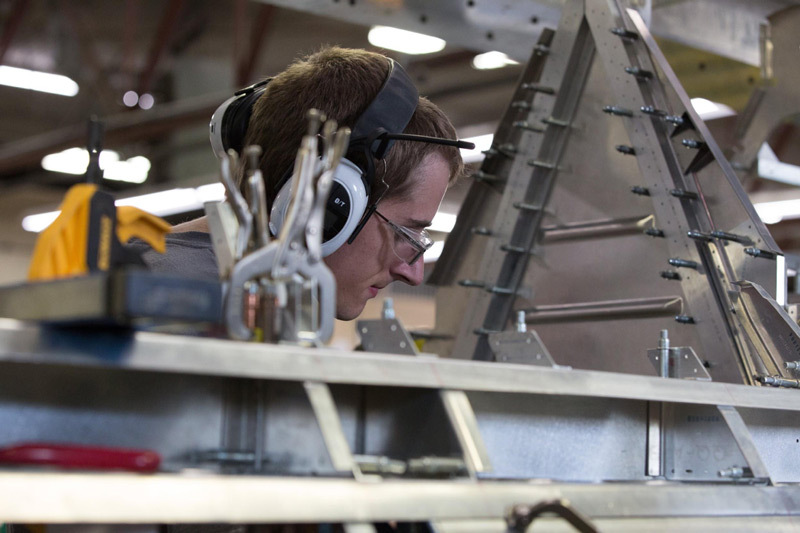 P-47: Fuselage StructureAaron works in the cockpit area just forward of the rollover frame. 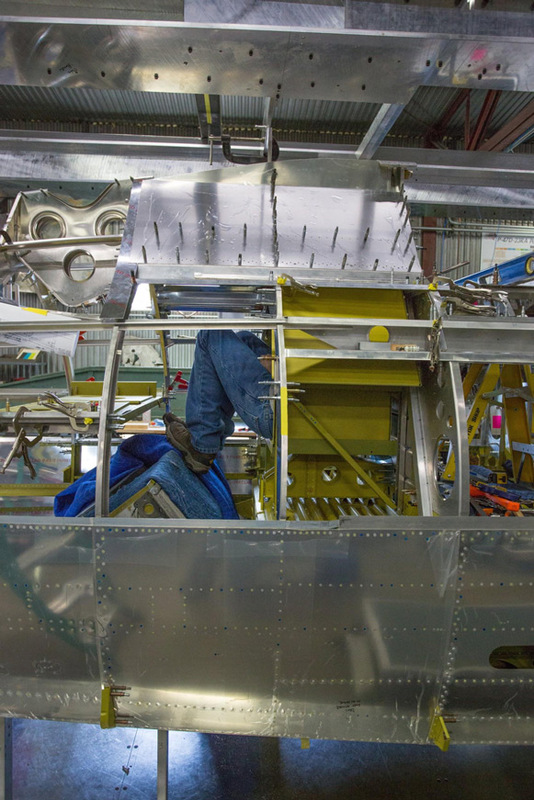 P-47: Fuselage StructureA similar perspective of the rollover frame shows the fuselage crash protector fitting. 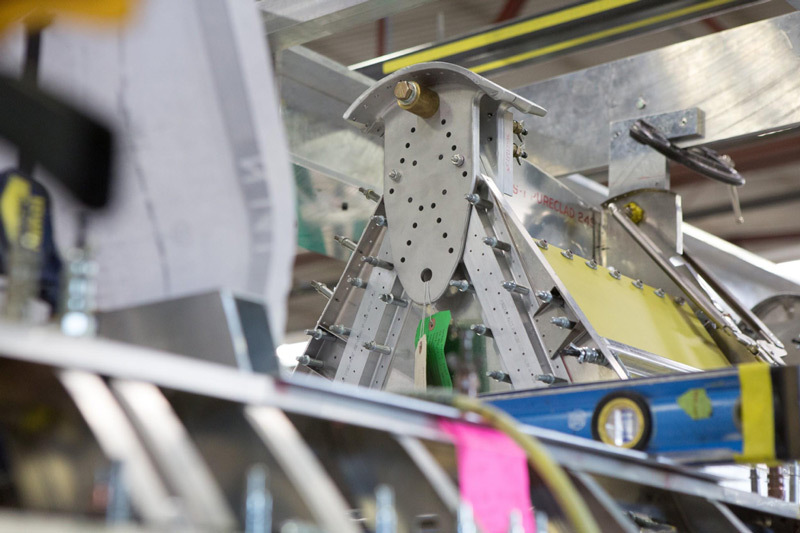 The green tag indicates the fitting will be proven serviceable if it passes dye penetrant testing. 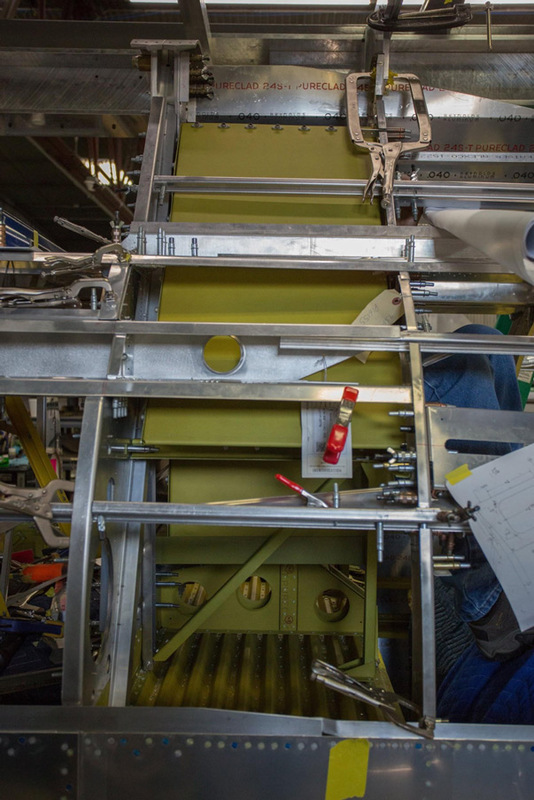 P-47: Fuselage StructureChad works on an interior panel of the main fuel bay. P-47: Fuselage StructureThis is the cockpit area and rear of the main fuel tank panel shown from slightly above. P-47: Fuselage StructureA side view of the same area with the protective pad removed lets us see the cockpit floor. 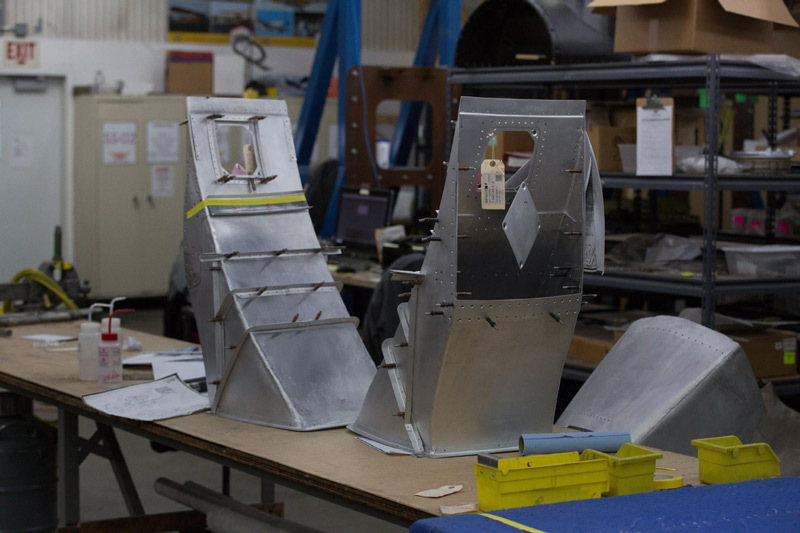 P-47: Fuselage StructureFrom near the rear of the fuselage, we look forward at the turtledeck supporting structure and the rear face of the intercooler. 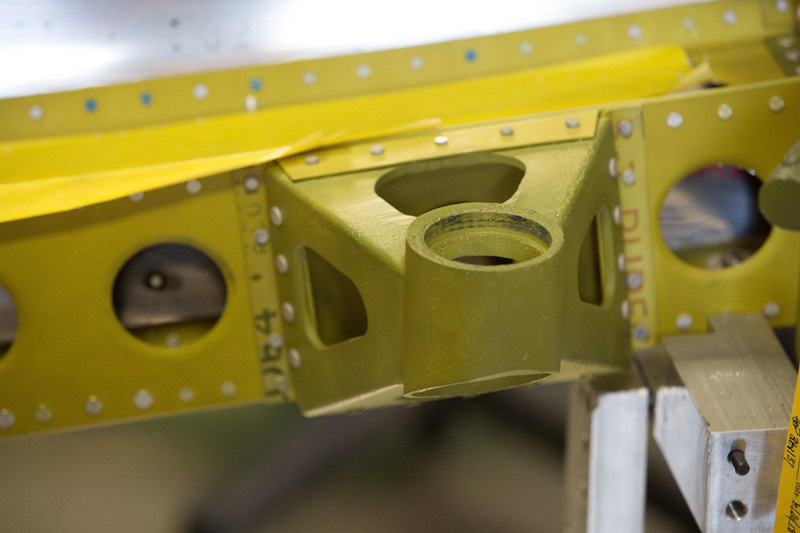 P-47: Fuselage StructureThe elevator lever support is clecoed in place between two fuselage formers. 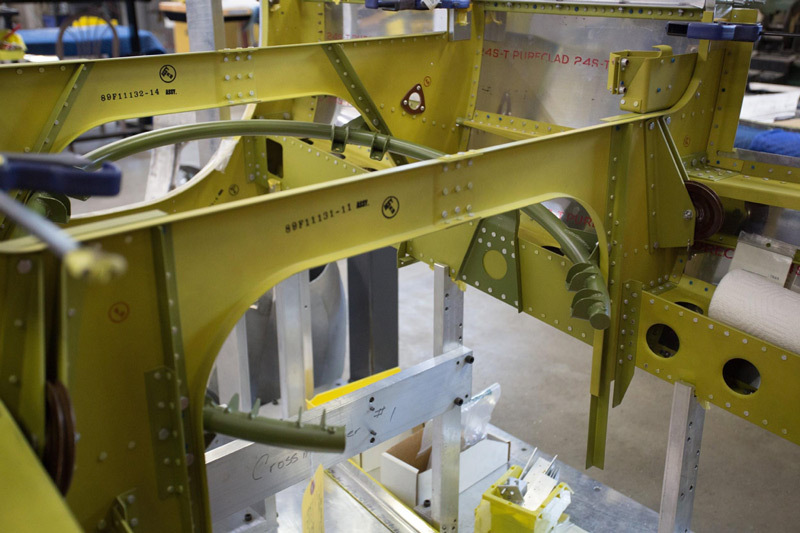 P-47: Fuselage StructureThis image shows the elevator lever support looking forward toward the rollover A frame. P-47: Fuselage StructureRandy works in front of the the cockpit to fit and install an arch assembly at station 132 of the upper deck, forward fuselage. P-47: Fuselage StructureThe instrument panel will be mounted to this former assembly as the restoration progresses. Sometimes it takes a great many clamps and clecos to hold a part tightly enough that rivet holes end up in the correct place and assure that the piece lays tight to the formers or structure beneath it. 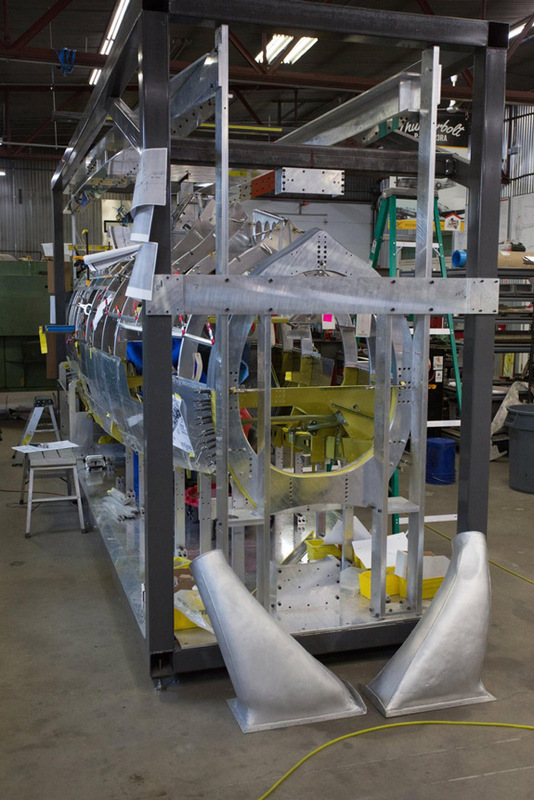 P-47: Fuselage StructureWork progresses on skinning the forward turtledeck. P-47: Fuselage StructureThis shot gives a good perspective on how big this fighter really is - Aaron almost disappears inside the fuselage. It isn’t like working on a Mustang! 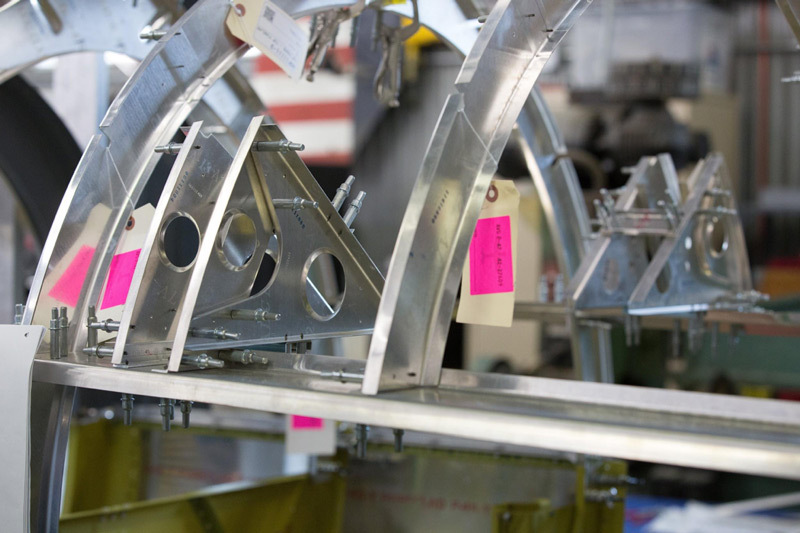 P-47: Fuselage StructureThe zinc chromated assembly inside the outer fuselage framework is the unique “ Christmas tree tank”. 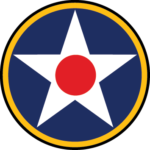 This was an innovation for the 5th Air Force to extend the P-47s range for long SW Pacific theater missions. P-47: Fuselage StructureThe added zinc chromated tank is visible in about the middle of the top line of the fuselage. 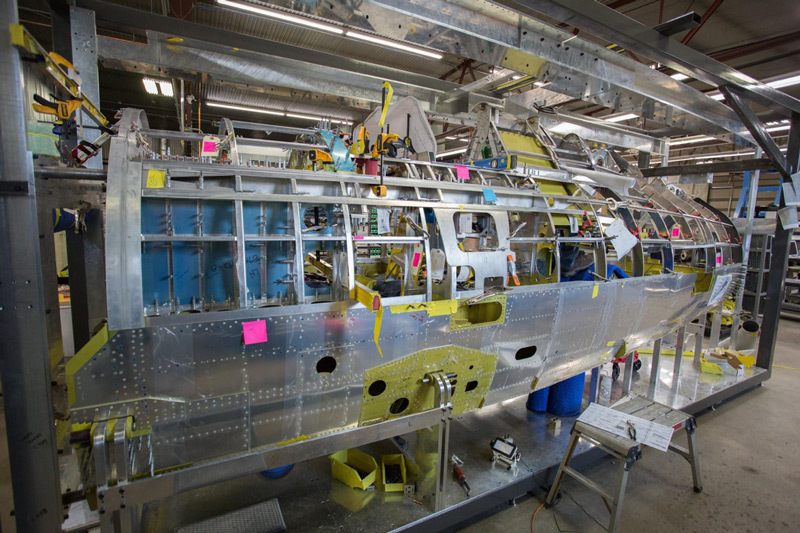 P-47: Fuselage StructureAs assembly gets more detailed, the guys insert engineering drawings into handy spaces in the structure for quick reference. 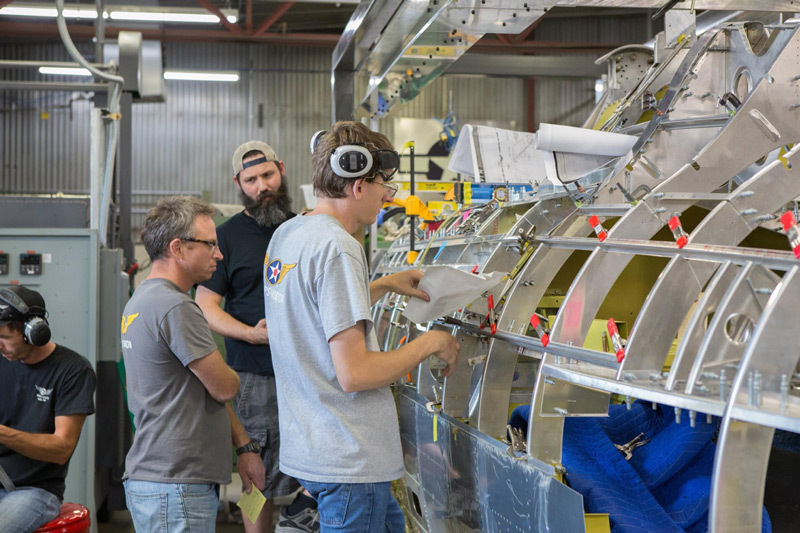 P-47: Fuselage StructureFrom the left: Dave, Ryan, Randy, and Aaron - The last three appear to be discussing the restorations progress. 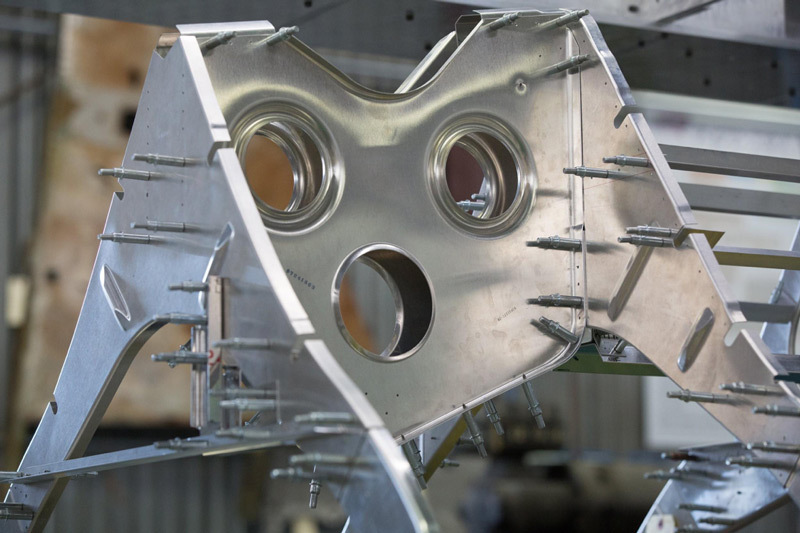 It is easy to see how much space the Harrison intercooler and associated ducting takes up, and why this system had so much to do with the Thunderbolt’s size and shape. P-47: Intercooler SystemThe front face of the complex intercooler faces forward and connects to the carburetor through ducting. It passes cooled, compressed intake air from the turbocharger to the carburetor intake. P-47: Intercooler SystemThe back side of the intercooler connects to ducting that takes air from the intercooler to the exit doors. The air gains heat as it flows through the intercooler and cools the compressed air that is headed forward to the carburetor. 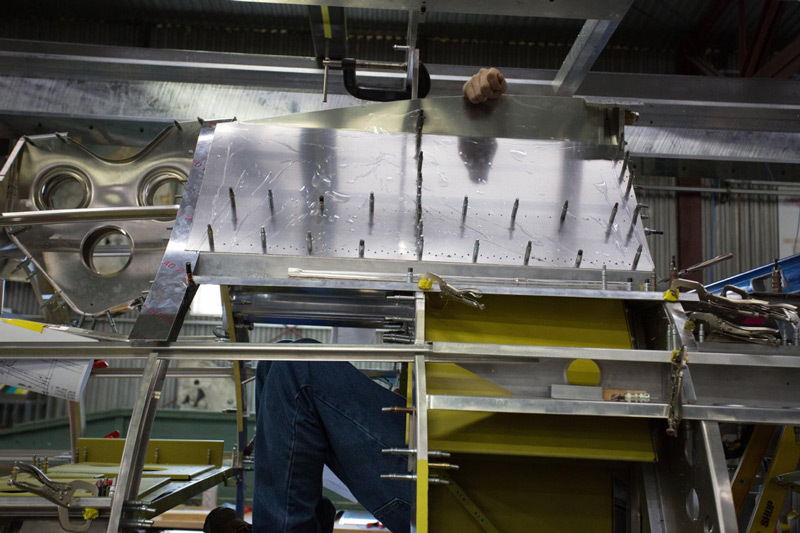 P-47: Intercooler SystemRobb prepares an intercooler exit duct for installation. P-47: Intercooler SystemThe intercooler exit ducts are clecoed together and ready for riveting. P-47: Intercooler SystemThe turbocharger mounting ring sits behind and below the ducting leading to the intercooler exit doors. P-47: Intercooler SystemThe two triangular former sections are actually supports for a pivot shaft that controls the intercooler exit doors. The open space below them is the hole where those doors will eventually mounted. P-47: Intercooler SystemIn this wider shot, we can better see the pivot shaft support’s relationship to the opening for the intercooler exit door. P-47: Intercooler SystemThis casting is where the bottom end of the intercooler exit door control pivot shaft mounts. Inspection and restoration of parts needed in upcoming steps goes on as always. 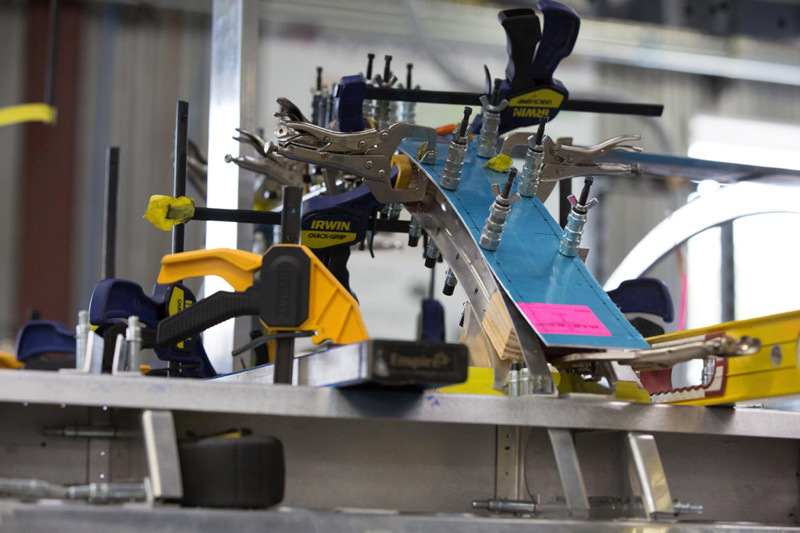 Another critical task is design and fabrication of the wing jig that will be needed after the fuselage is essentially complete. 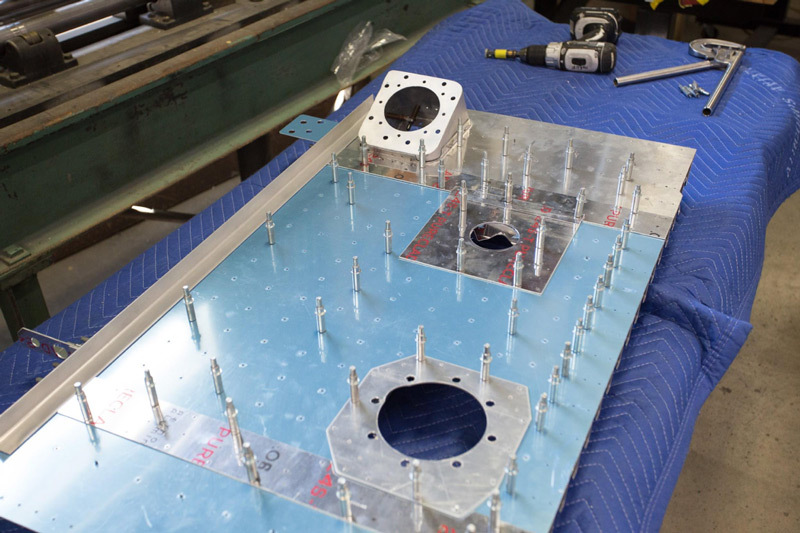 Steve Wold, of our CAD engineering department, shared his work on that wing fixture. It isn’t complete yet, but rather a work in progress. 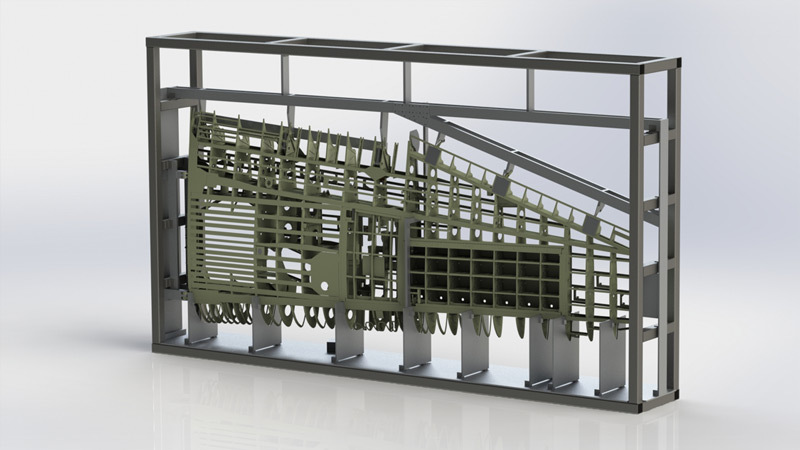 P-47: PartsThis CAD rendering of the future wing fixture is the result of hours of design work. 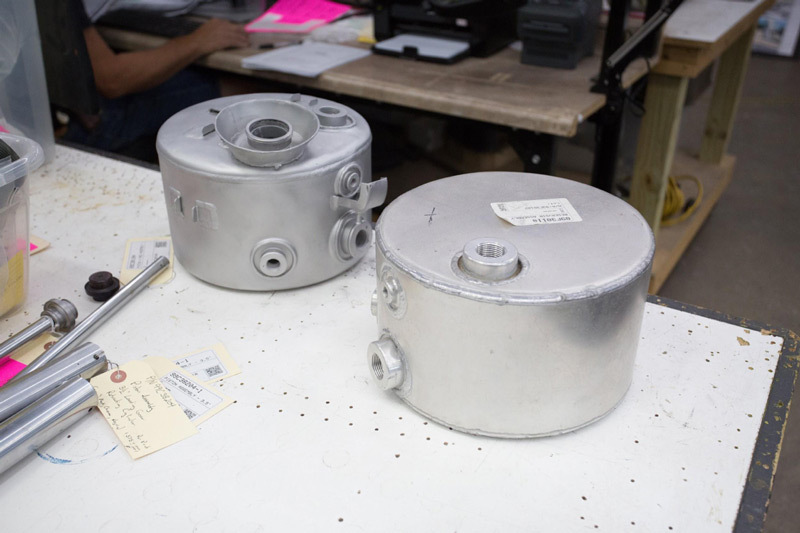 P-47: PartsOf the two hydraulic reservoirs seen here, the one in front is a reproduction, while the one behind is an original Republic part that will used in this restoration. 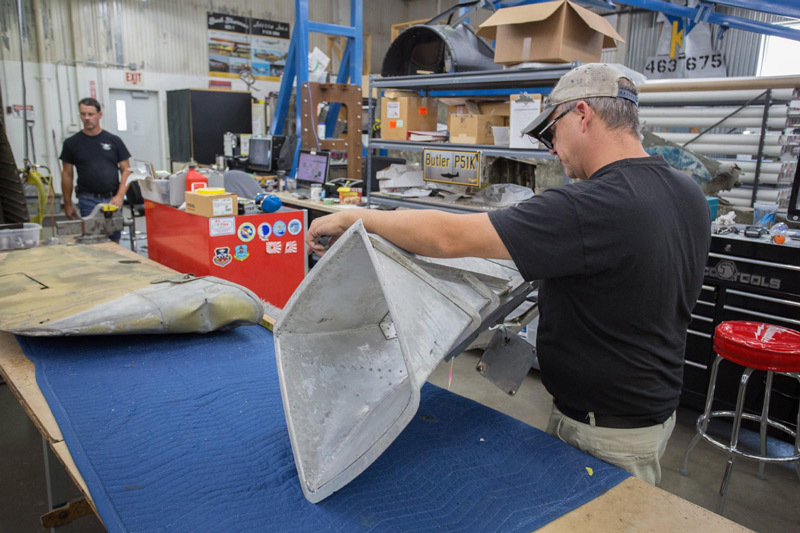 Lance SumstadLance disassembles and inspects a tail wheel strut. Our profile subject this time is Lance Sumstad. Lance is a relatively new face in the restoration shop. 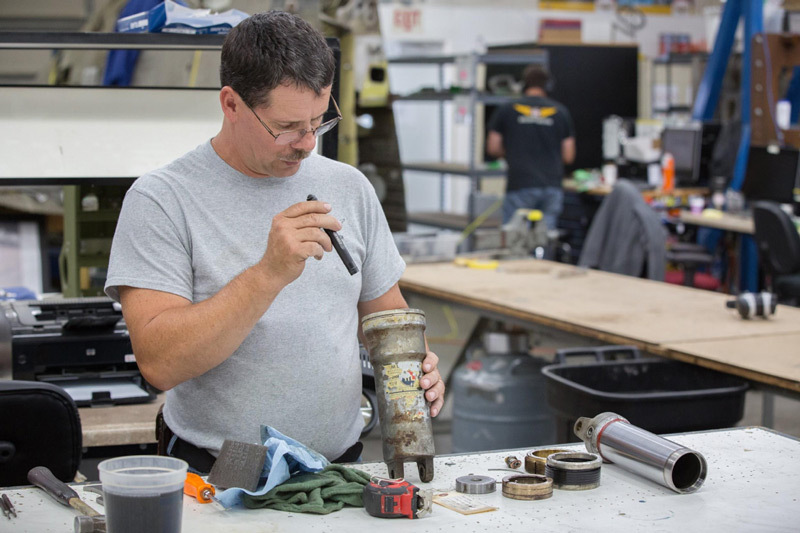 His background is varied and interesting and his skills are a welcome addition to the restoration crew at AirCorps Aviation. Lance was a B-52G crew chief and currently is a licensed outstation A&P mechanic. He owned his own welding and manufacturing business making a wide variety of products including truck utility bodies, trailers, and specialized ice fishing trailer/houses that can be lowered onto the ice surface by rotating the wheel assemblies. 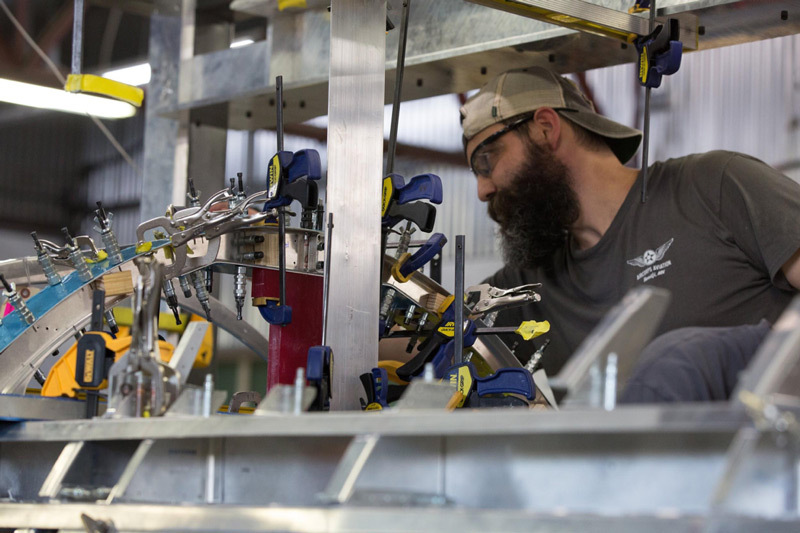 Lance also worked as a production manager at a laser and powdercoating business, and designed production equipment for Mann Lake, LTD a beekeeping supply company. Akeley, Minnesota is where Lance and his wife Sheri call home. They have a grown son and daughter and are blessed with 5 grandchildren The Air Force runs in the family, both of the Sumstad offspring also served. 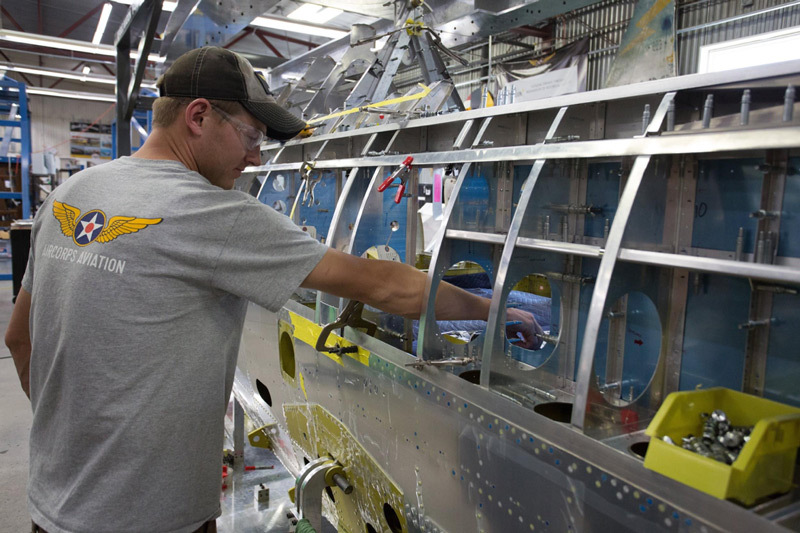 Lance’s favorite warbird is the P-47 he is currently working on. 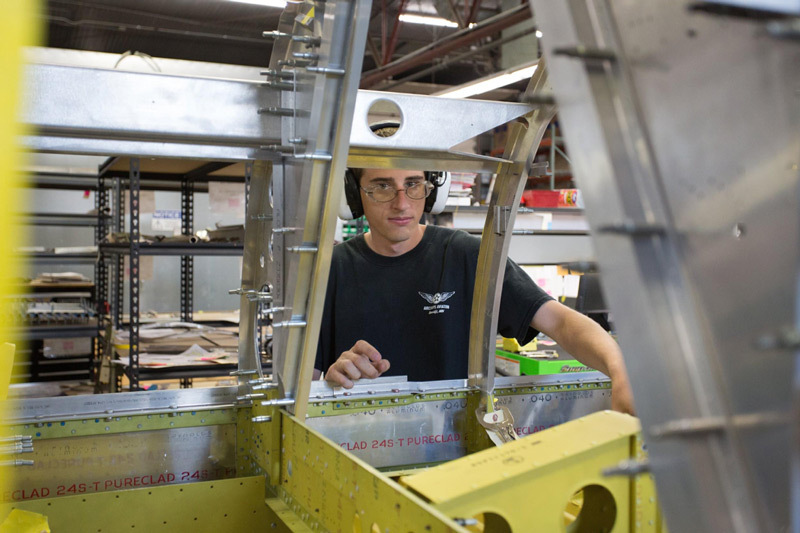 He says the best part of his job at AirCorps Aviation is working with knowledgeable and talented people in a very organized and structured company. Love to see the Chuck Hall Aviation decal on the side of the red tool box!! Amazing work going on there! Seems like so much has been done since our visit in June. Thanks for sharing all the progress with us! True craftsmen! Wonderful staff!